We’ve taken a look back through our archives and found these images of the dancing events in the north-east taken over the past few decades. A woman whose audition video to dance with Janet Jackson went viral after a cop helped her out has now performed with her idol. An inspirational north-east granny has danced her way to a massive charity donation and is showing no signs of slowing down. Being in hospital for a long time can get you down – but one patient got a welcome pick-me-up when his doctor danced for joy to celebrate his improving condition. Amateur dancers are set to take to the floor as part of a competition in aid of charity. A 90-year-old grandmother who struts her stuff at twice-weekly Zumba classes has encouraged others to follow in her expertly-choreographed footsteps. A ballroom dancing event in Aberdeen has helped a charity waltz off with more than £25,000. A young ballerina has seen off stiff competition to be awarded a place at a prestigious Scottish college. 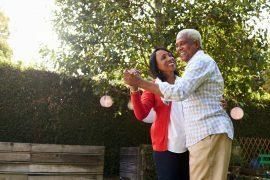 Breaking out into your favourite dance moves on a regular basis could help keep your brain healthy, a study has found. A Strictly Come Dancing star is waltzing his way to Aberdeen in an effort to bring back ballroom dancing.